Bob’s keynote at the conference went well. As the clapping died down, the rush of elation felt like a victory. By lunch, his mood had slumped and he was feeling alone and, actually, a little resentful. When Bob contacted me about coaching, he was restless and irritable. He said he was working as hard as ever and feeling discouraged. The long hours at the office and time on his computer at night was taking a toll on his family life. His wife felt slighted and his kids mumbled that he was grumpy all the time. His routine felt like a grind. All that effort at work and the results were good but there didn’t seem to be any teamwork or appreciation for what he saw as his sacrifices. To get our coaching started I asked him to complete an exercise called the Wheel of Life, which offers a simple and effective way to gauge someone’s current level of satisfaction. 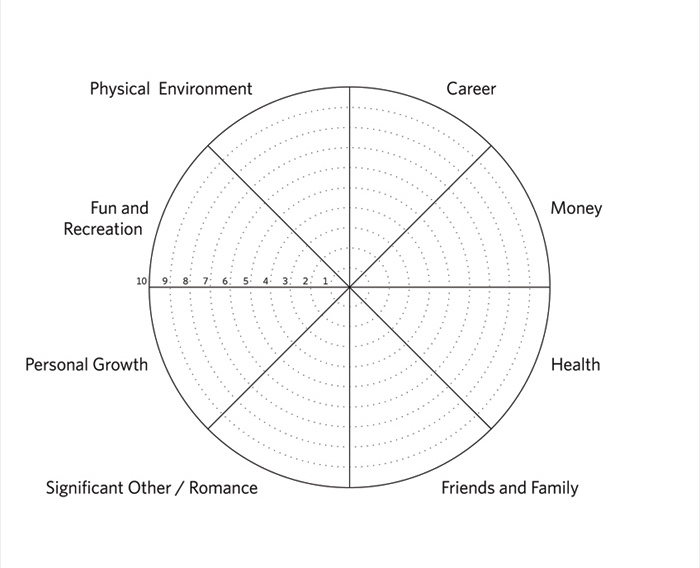 Then rate your current fulfillment for each one on a scale of 1 to 10. It’s quick, easy and provides a “snapshot” of today’s level of satisfaction. Bob reported moderate to low satisfaction with his job (5), his relationship with his wife (6), his family time (5), and even with fun and recreation (3-4). For the second part of the exercise, I noted to Bob the rating of 5 that he gave to Career and asked him to imagine what a 10 for him would look like. This is a basic coach technique; we invite a client to imagine an ideal outcome and then hold that vision as a goal. Next, after acknowledging where we are now, we collaborate and devise a strategic action plan to close the gap and make the vision a reality. The Wheel exercise helped Bob get in touch with his current level of discontent and start the process of identifying solutions. We quickly pinpointed the focal point as time. Bob had been promoted into a bigger job with more responsibility and he hadn’t fully embraced his new role. We worked together on establishing priorities, improving time management; and then, delegating and coaching his direct reports to take on more ownership. The transition took some time. As Bob’s staff members took on more responsibility, they developed new competencies. Bob got out of the weeds and began to lead more and manage less. He felt less stressed out and was able to enjoy his family again. He also stopped bringing the ghost of an unhappy home life to the office. We know that simply completing the Wheel exercise will not turn around major issues. It can be a useful tool, however, to highlight areas of dissatisfaction and facilitate the process of identifying paths to greater fulfillment. The challenge is to mind the gap. Don’t be a prisoner of your past. Be a pioneer of your future. This entry was posted in 2015, Change, Personal Growth, Strategy by lhedblom. Bookmark the permalink.